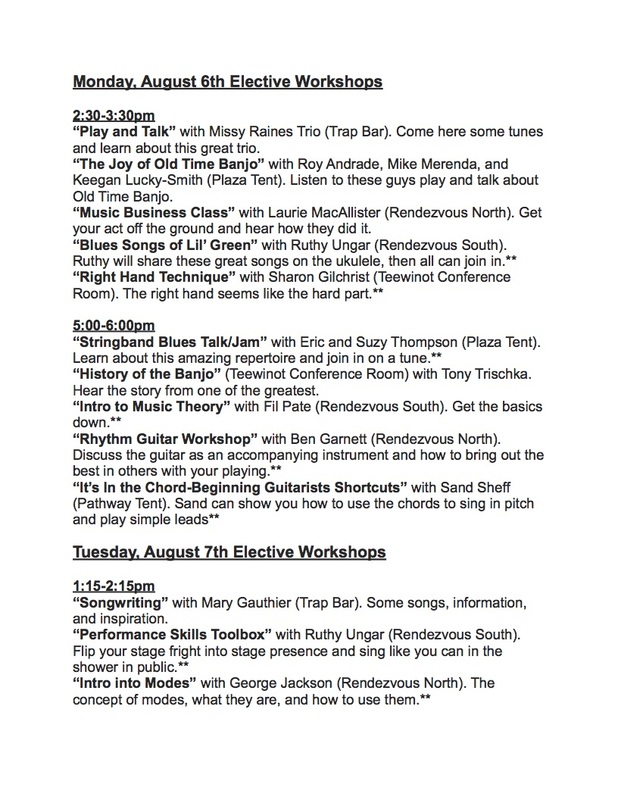 The 14th Annual Targhee Music Camp is a 3½ day educational event, being held August 5-8, 2019 at Grand Targhee Ski Resort in Alta, Wyoming. 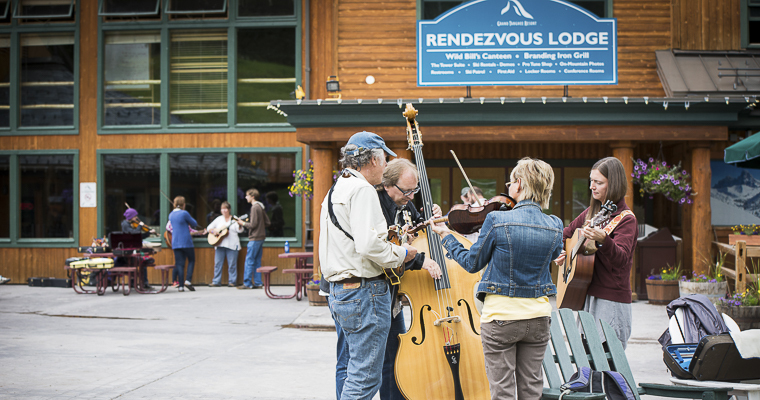 This is the week leading up to the 32nd Annual Grand Targhee Bluegrass Festival. Classes begin on Monday morning and end Thursday afternoon. Many attendees arrive Sunday night as we start at 9am on Monday morning. There is an instructor concert Thursday night that is open to the public. The festival begins on Friday and runs through the weekend of August 9-11, 2019. For more information about the Grand Targhee Resort, please visit their website www.grandtarghee.com. Secure your spot at Targhee Music Camp by registering and paying tuition for camp on this website. Tuition for 2019 is $650. 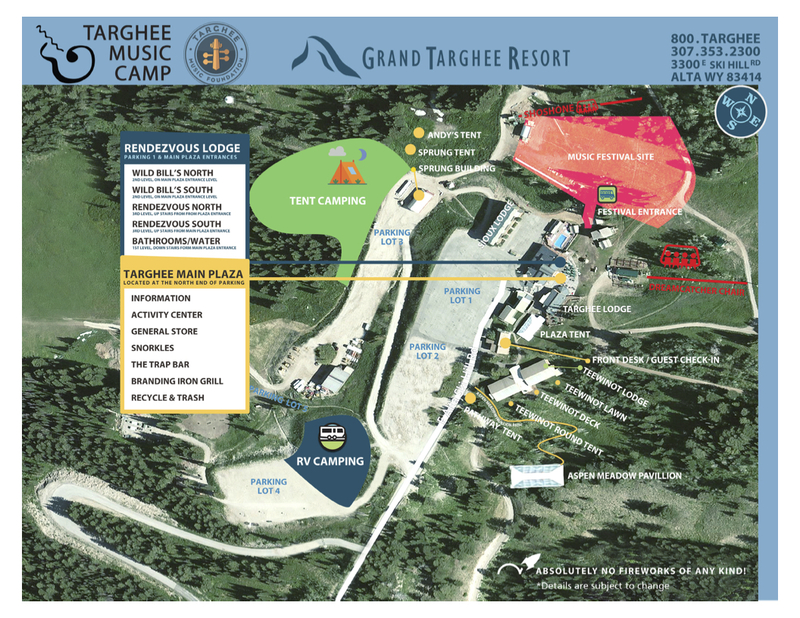 After you have registered and paid for Targhee Music Camp you will contact the Grand Targhee Resort at 1-800-827-4433 ext. 1 between the hours of 8:30am and 4:30pm MST. Be sure to tell them you are with “Targhee Music Camp” to get the best rates available. 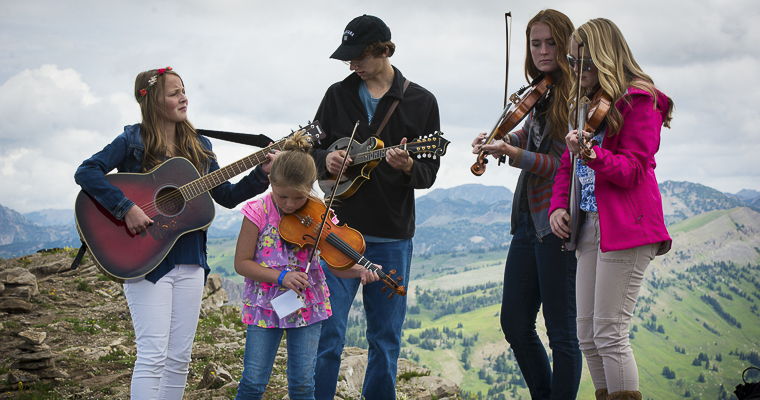 Tuition for this year’s Targhee Music Camp is $650. This includes your primary class, workshops, jam sessions, concerts, lift ticket to mountain top jam etc. To register for camp, go to our Registration Page. 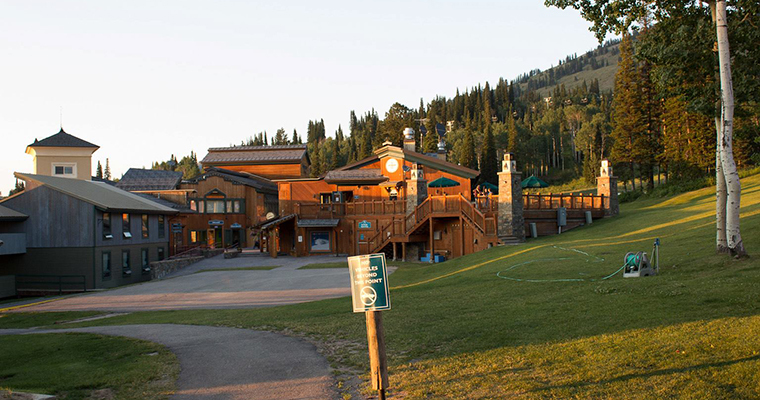 Grand Targhee Resort is offering special rates for Targhee Music Camp participants for the nights of August 4th, 5th, 6th, and 7th, 2019. To book rooms please contact Grand Targhee Resort at 1-800-827-4433 ext. 1 between the hours of 8:30am and 4:30pm MST and say you are attending “Targhee Music Camp”. You must be registered and paid in full for Targhee Music Camp to secure these dates and rates. Book your rooms early. $276/night for Sioux Lodge 2 bedroom. We encourage participants to book lodging at the Grand Targhee Resort. Many participants report that having the comfort and convenience of a room makes camp even better. The Teewinot Lodge has 43 rooms. Our goal is to have our participants book 40 Teewinot rooms so the lodge is considered “private.” All the rooms that we use for instructors and staff go towards this goal. Because the resort is such an important Summer tourist destination, the discounted rooms must be booked by July 1, 2019. Let’s fill it with guitars for these 4 nights! All camping reservations will be made through the Grand Targhee Resort at 1-800-827-4433 ext. 1 between the hours of 8:30am and 4:30pm MST. The price for tent camping or RV camping for August 4th, 5th, 6th, 7th and 8th will be approximately $28 per night. There is a lower price for ages 12 and under. The price of camping goes up a bit after July 8, 2019. Each person camping in a tent or an RV needs to purchase a per night camping pass. Each person in an RV needs a pass. There are no electric or water hook ups for the RV’s. You will be “dry camping”. Showers are included in the price of camping. Most participants purchase 4 or 5 nights of camping, beginning with Sunday August 4, 2019 in order to be on site when Targhee Music Camp begins at 9am on August 5, 2019. If you are staying for the Thursday night final instructor concert, but not staying for the bluegrass festival, you’ll want to purchase camping for Thursday night. If you are staying for the festival and camping, you’ll purchase camping for music camp and for the bluegrass festival separately. Festival camping passes start with Thursday night. (See festival camping under festival). Your campsite ends the morning of August 8th, unless you have purchased camping for the festival or purchased camping for Thursday night. If your camping is over on Thursday morning you’ll need to move your car/camper to the upper lot by 10am. The resort can no longer guarantee that the campsite that you have for music camp will be the same one for the festival. This is a likely possibility but not guaranteed. The resort and camp will have volunteer campground co-ordinator(s) on site Sunday from 4-8pm and again on Thursday morning. Please work with the campground volunteers to camp in the appropriate spot. Because you will be on site before so many of the festival attendees, you will get a great camp site. Ask if you are in the right spot before you set up your camp site. Meal plans for Targhee Music Camp are available for purchase. All meal plan purchases will be made through the Grand Targhee Resort at 1-800-827-4433 ext. 1 between the hours of 8:30am and 4:30pm MST. The Meal Plan price for 2019 is approximately $260. The Meal Plan includes 3 breakfasts, 4 lunches and 3 dinners starting with lunch on Monday, August 5th, 2019 and ending with lunch on Thursday August 8th, 2019. Meals will be served buffet style in Wild Bill’s. The food is homemade by Grand Targhee Resort and quite tasty and nutritious. Vegetarian and special dietary meals are available with prior notice. The resort cannot guarantee vegan meals, but many vegans have used the meal plan. Parents and spouses of Targhee Music Camp participants may purchase a meal plan. We are not able to sell individual meals. On August 5th, 2019, breakfast will be available for purchase in the resort restaurant. 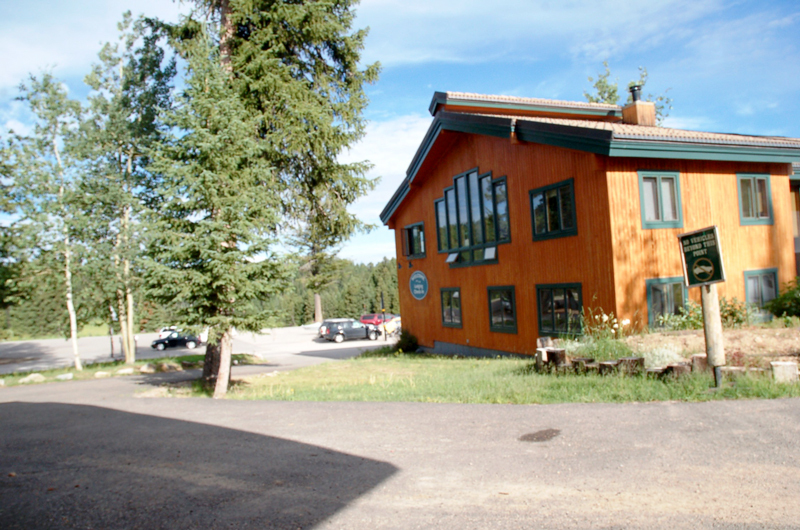 There is one restaurant and a small general store at Grand Targhee. We receive many compliments each year about the food and many participants enjoy the convenience of the meal plan. 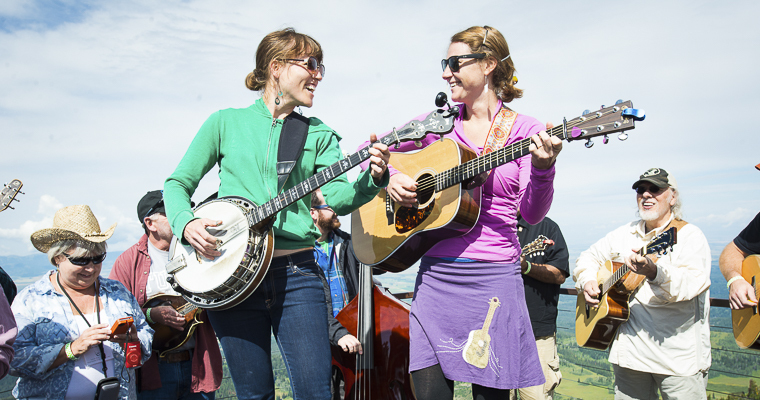 The 32nd Annual Grand Targhee Bluegrass Festival takes place August 9th, 10th and 11th, 2019. This is a world-class festival, offering music in a beautiful setting. The festival is separate from Targhee Music Camp. Make your arrangements early. Participants of Targhee Music Camp may purchase a discounted 3 day festival ticket from the Grand Targhee Resort. This ticket is the early-bird price and is approximately $159. To get your discounted 3 day festival ticket call 1-800-827-4433 ext. 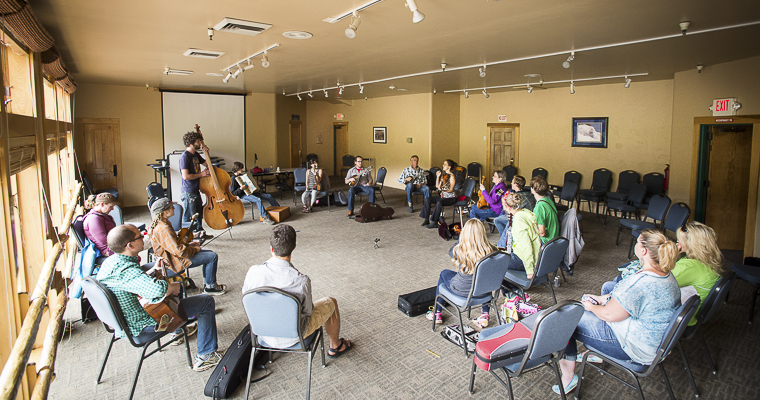 1 between the hours of 8:30am and 4:30pm MST and be sure to mention that you are a “Targhee Music Camp” participant. Only participants registered with tuition paid are eligible for the discounted 3 day festival tickets. Family and friends need to purchase tickets separately. Grand Targhee is located just outside of Driggs, Idaho. The closest airports are Jackson Hole, Wyoming (45 miles) and Idaho Falls, Idaho (84 miles). Both airports are about an hour and a half drive to Grand Targhee and served by many airlines. Targhee Music Camp participants have also used the Salt Lake City, Utah airport (about 300 miles) and the Bozeman, Montana airport (about 200 miles). It takes a bit of patience to get to Grand Targhee AND it is worth all your effort to get here. From Driggs, follow Ski Hill Rd./Little Ave. east for about 6 blocks. You will reach a fork. Bear left and the road becomes Ski Hill Road. Remain on Ski Hill Road through Alta, Wyoming and on up the hill. Ski Hill Road ends at Grand Targhee Resort, about 13 miles from Driggs. For more info visit: www.grandtarghee.com or call 1-800-827-4433 ext. 1 between the hours of 8:30am and 4:30pm MST. The Jackson, WY airport and the Idaho Falls, ID airport are both about and hour and a half drive to Grand Targhee. There is not a free shuttle from these airports to Grand Targhee. Grand Targhee does offer shuttle service. To make reservations call 1-800-827-4433 ext. 1 between the hours of 8:30am and 4:30pm MST. The cost is approximately $60. Taxis can also be arranged, usually at a much higher price. Participants have also organized sharing rental cars/rides on the Targhee Music Camp Facebook page. Having your own car in the Tetons gives you freedom to explore. Rooms at Grand Targhee (about $96-276/night) August 4th, 5th, 6th and 7th, 2019. Reservations made through Grand Targhee 1-800-827-4433 ext. 1 between the hours of 8:30am and 4:30pm MST. 3-Day Festival Pass-Approximately $159 purchase from Grand Targhee Resort. 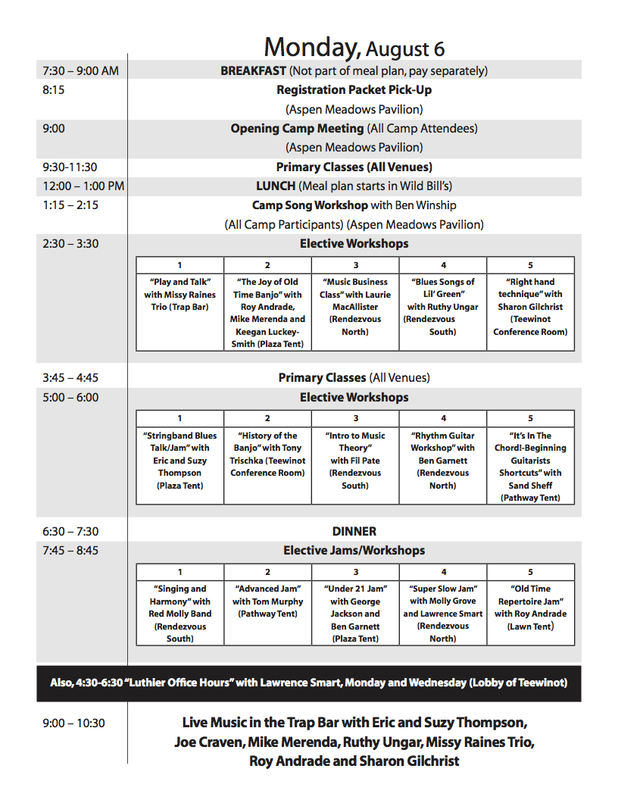 Here is an example of what a daily schedule at Targhee Music Camp can look like. 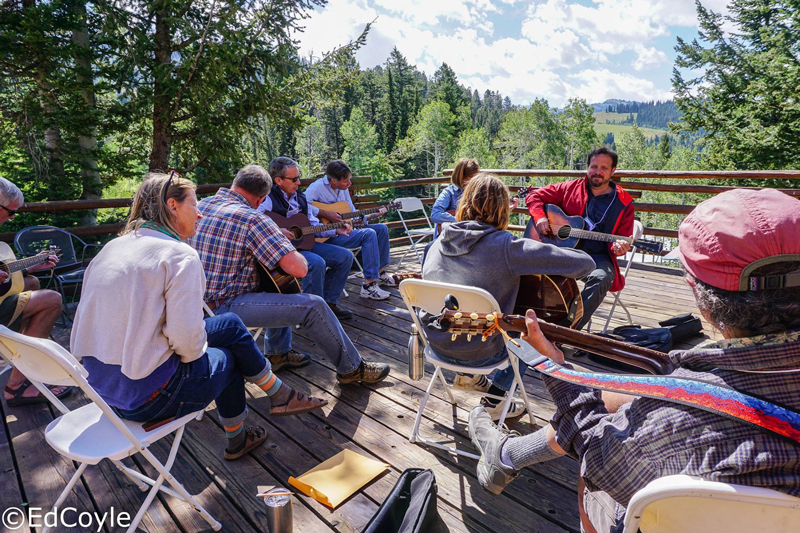 Each summer Targhee Music Camp has musicians and music fans of many different abilities from just past beginning to some of the best musicians in the world. When potential camp participants ask if they are good enough to come to camp, our response is usually: “Do you know 3 chords? Can you lead one song? 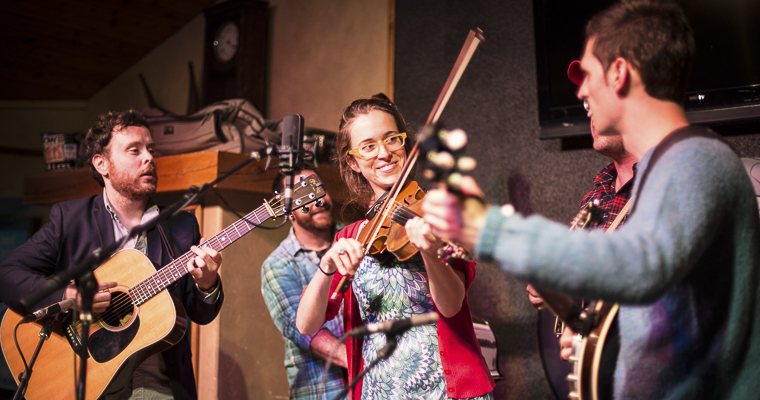 Do you know one fiddle tune?” And if they answer yes to any of these they probably can get a lot out of their time at Targhee Music Camp. Absolute beginners might find lots of interesting ideas but will only get so much beyond a great time. Classes are generally geared toward intermediate players. 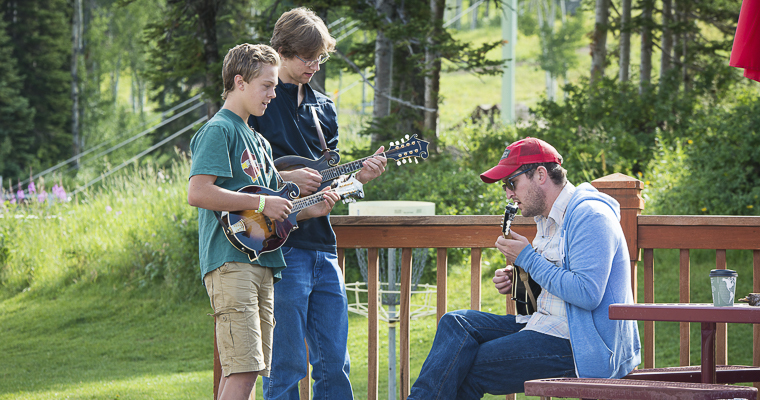 Each year at Targhee Music Camp there is a jam session at the top of the mountain. We will ride the chairlift and play tunes on the platform again. It is an amazing view. The jam takes place at just under 10,000 feet elevation with the Grand Teton in the background. 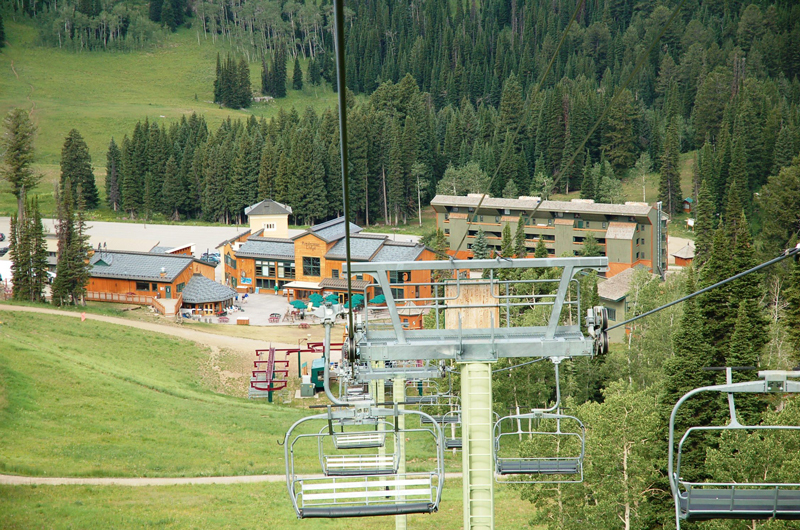 Each Targhee Music Camp participant will receive a FREE lift ticket to ride the chairlift to the top of the mountain. Grand Targhee majestically sits at 8000’ feet so expect mountain weather – anything from 80’s during the day to 30’s at night. You may want to have warm clothes and rain gear to take advantage of your surroundings. Don’t forget shorts, a swimming suit, sunscreen, hiking boots, or a mountain bike. Also bring picks, rosin, extra strings, tuner, watch, recording device, notebook and extra batteries. Driggs, Idaho is the closest town (13 miles). Here you will find a post office, a health food store, grocery, a pharmacy, a few restaurants, bakery, drive thru coffee, several gas stations, banks, etc. Participants 17 years and under must be accompanied by an adult. For participants under 12 years old, please contact Thomas Sneed. Please contact Grand Targhee Resort concerning their dog policy. $150 of your paid tuition is non-refundable. If you have paid your tuition and are not able to attend camp your non-refundable $150 will be donated to the camp. After July 15th, 2019 we do not offer refunds. All lodging, camping, meal plans and festival ticket cancellations are subject to Grand Targhee Resort’s refund policy. Please note these policies when you book with Grand Targhee Resort.